How much does an Apple store cost? Apple loves to talk about its stores. They do it in every conference call, keynote event and SEC filing. There is a monotony with the repetition of how many they have and how many they are building and how pretty they are. They start to seem like commodities. But if they were commodities why aren’t there any other networks of successful “vendor stores”? The answer is partly in the odd integrated business model Apple maintains asymmetric to every other modular technology provider. Apple seems to want to control the relationship with the buyer. It’s also partly in the uniqueness of design, an obsession with the brand. But still, that does not explain why can’t it be copied. The answer is in the economics. 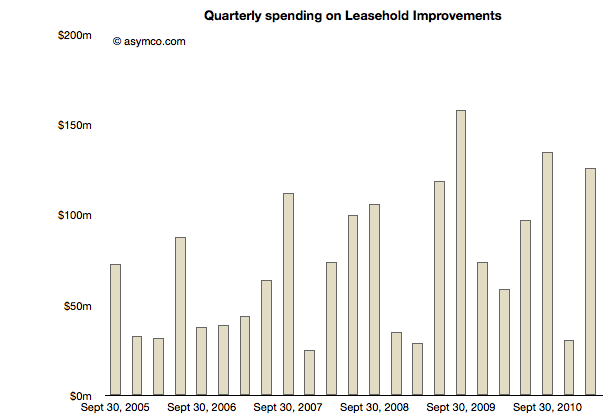 The following chart shows the change in that figure quarter-over-quarter. This is a very consistent pattern. 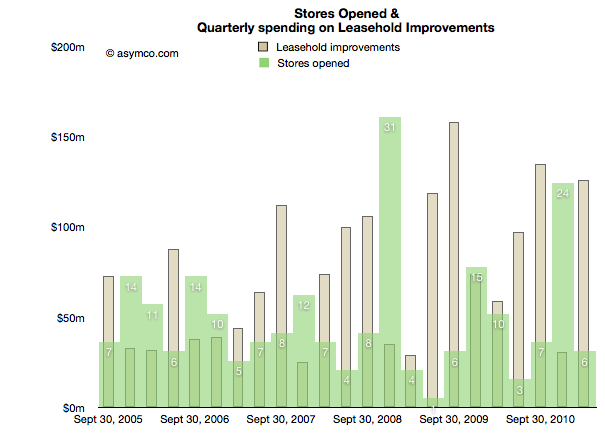 The rise and fall in expenses is matched by the subsequent rise and fall in store openings. We can even see how stores seem to be getting more expensive with the amplitude of the waves increasing relative to the amplitude of the openings. So if we are looking at store costs, just how much does one cost? 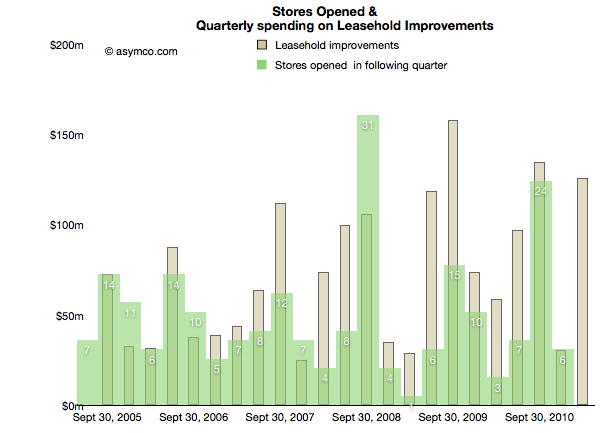 Over the time period illustrated, Apple opened 220 stores and spent $1.9 billion in fitting them out. That’s about $8.5 million per store. It’s been increasing so it’s probably closer to $10 million lately. That’s an interesting figure by itself, evidence of how profitable they must be. But I turn the question again to competitiveness and the lack of response in kind. So assuming a competitor (e.g. Microsoft) did commit to this spending, how would they recover it? I’ll keep this question rhetorical, but the hint must be in the unique way Apple is integrated as a business. › Next Post How much do Apple's factories cost?